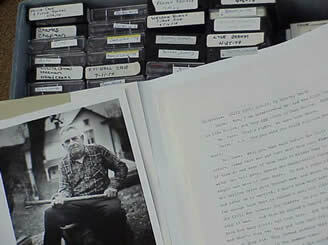 Records an interview with LeRoy Nicholson, who lived in Weakely Hollow, near Old Rag Mountain, in Madison County, Virginia, until 1929. Describes daily life in the mountains, the means of growing and preserving food and other aspects of the local economy. Discusses popular pastimes, herbal remedies, holidays, courtship, and the moonshine trade. Also discusses his memories of local entrepreneur, George Freeman Pollock, owner of Skyland resort, and his service with the Civilian Conservation Corps during the construction of Skyline Drive. Civilian Conservation Corps (U.S.) -- Virginia -- Shenandoah National Park – History; Civilian Conservation Corps (U.S.) Camp S-60 -- Shenandoah National Park – History; Civilian Conservation Corps (U.S.) Company 1390 (Va.) – History; Mountain people -- Blue Ridge Mountains -- Social life and customs; Mountain life -- Shenandoah River Valley (Va. and W. Va.) – History; Mountain people -- Virginia -- Shenandoah National Park -- Social life and customs; Rural poor – Virginia; Country life -- Appalachian Region, Southern; Traditional medicine -- Shenandoah River Valley (Va. and W. Va.); Folk music -- Shenandoah River Valley (Va. and W. Va.); Food habits -- Appalachian Region, Southern; Holidays -- Shenandoah River Valley (Va. and W. Va.) – History; Funeral rites -- Appalachian Region, Southern; Hunting -- Virginia -- Shenandoah National Park; Courtship -- Virginia – History; Land use -- Government policy -- United States. Madison County (Va.) – History; Weakley Hollow (Va.) -- History -- 20th century; Skyland (Va.) – History; Skyline Drive (Va.) – History; Shenandoah River Valley (Va. and W. Va.) -- Manners and customs; Shenandoah National Park (Va.) -- History, Local.